BRIGHTON Primary school had another successful season in the after school winter roster at Creek Road netball centre. The grade five/six team came a very credible second in division one against some very tough competition. 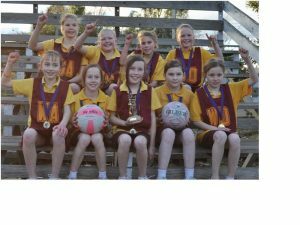 Brighton Primary School grade three/four Maroon netball team topped the ladder with an incredible 14 wins from 14 games. Graded at level 10, Liv is Tasmania's top ranked female gymnast. OLIVIA (Liv) Burnett recently demonstrated she is one of Tasmania’s most successful competitors in women’s gymnastics. 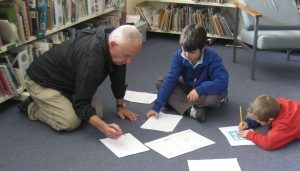 BOOK Week came to Gagebrook Primary School recently, and students enjoyed a real treat when Tasmanian author and illustrator Steve Isham visited the classroom. CHRISTINE Gimblett, a Bridgewater mother of three, has achieved a personal milestone – and now her story has been broadcast across Australia and beyond. Amid the ‘hoo-haa’ of the final week of the Federal election, a five-minute radio interview with 31-year-old Christine was broadcast on ABC radio’s PM program through 60 stations around Australia. Radio Australia took the interview further afield to untold thousands of listeners in Asia and the Pacific. 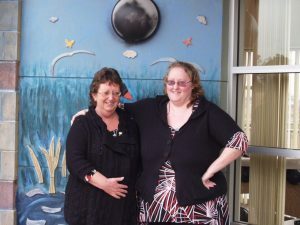 Helen Manser, left, shares some happy memories with mother of three, Christine Gimblett of Bridgewater. BRIGHTON’S Strategic Plan will be reviewed and updated at workshops to be held this month.